Happy Thanksgiving to our American players! 1) New Age Sealed events are now running in the free event slot of Tournaments. New Age packs include cards from Light Ascending, Descent into Darkness and Gods Reborn. 2) There is a new Christmas card in the Holiday section: Santy Claws! This jolly beast will give a "Gift" spell to each player based on their Alliance (no gift for Unaligned - Bah Humbug!). 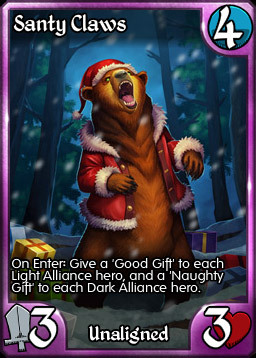 When you play the gift spell, you'll receive a good card from your Alliance. All of the cards you can get will have an impact - no cards you can't use! NOTE: All players who play on Christmas day will receive one copy of Santy Claws for FREE! 3) The Xmas Bundle will be available for purchase on Dec. 1, 2015 and will run until Jan. 1, 2016. As with our Halloween Bundle, this $10 pack includes 4 holiday cards and 50 Gems. 4) AI Improvement: The AI is now able to target creatures with spells and abilities that can target a hero or creature. 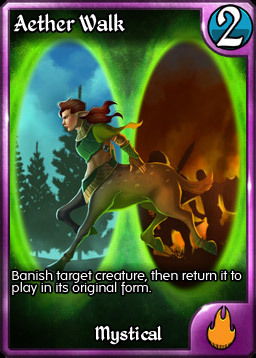 5) AI Improvement: The AI will now play creatures with On Enter effects that target an opposing creature (like Sylph Assassin) much more intelligently. 6) The Grovenhold bug has been fixed. War March can no longer target creatures that had conditional Haste, but lost it. 7) Creatures that have haste removed on the turn that they came into play through Empower or Augmentation Blast now properly show that they cannot attack. 8) Shimmermail Armor has been fixed. It wasn't preventing Magic damage when only 1 point was done. Now it does, and yes, they do stack. So if you have 3 in play, you will prevent 3 points of Magic damage per trigger. 9) Stiff Drink can now properly target enemy creatures. Light Ascending, Descent into Darkness, Gods Reborn. In the past year we've seen 207 new cards added to Kingdoms, many of which that have seen huge amounts of play in constructed. 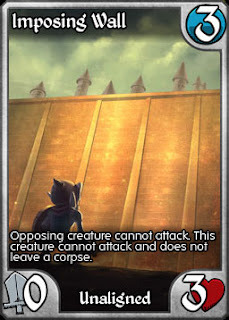 Yet there have been numerous cards in these sets, the commons in particular, that haven't had a chance to really shine. Many would be sealed deck all-stars, but there hasn't been a sealed format that includes these cards. 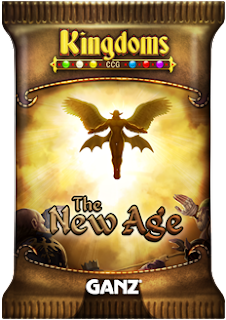 Starting with tomorrow's release, you will have a new Sealed format to enjoy: The New Age. These event-only packs each include 10 cards from all three of the new sets. So you can open a Mek Unit beside a Shrieker beside a Scroll Maker. New Age Sealed uses 6 packs instead of 8, as the quality of the cards included are significantly higher than previous formats. This still gives you 60 cards in which to find your 25. In our internal testing, we often had 30+ cards that we wanted to play, and struggled to whittle our decks down to optimal size. Card evaluation is surprisingly tricky in New Age sealed. Top cards like Scroll Maker and Fae Paragon aren't as strong when you can't support them with the right cards, while the rarely played Whack becomes a key piece of removal. The Charms in particular will be question marks for your deck as you will always be Unaligned. 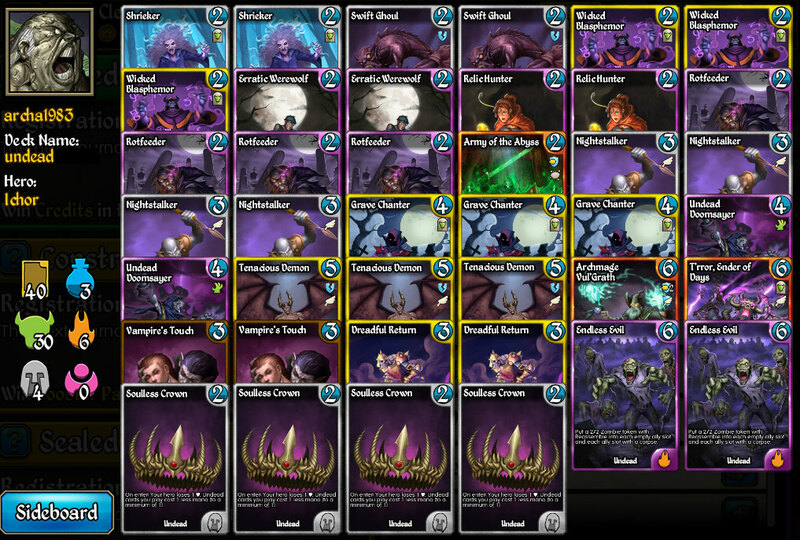 The deck starts out with three must-play rares: Lord of Night, Skullcrusher Giant and Stone Barrage. These three cards alone makes this deck a top contender. 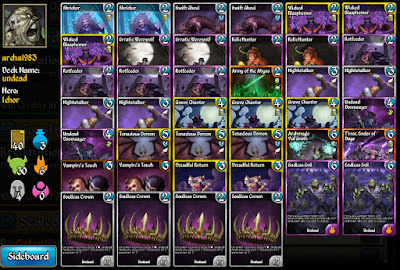 The deck is low on a direct removal, with just the three Mindshears (no Whack, Vampire's Kiss or Flame Barrage to be found), but adds Nightstalker, Elara's Zealots and three haste creatures to help clear problematic opposing creatures. Imposing Wall and Drillspiker also create problems for the enemy Hero. Also note the Steelrend Sandblade, Upstart Troll and Gentle Giant. These commons, while simple in design, sport very efficient stats and could be key cards for this new format. Even here we only went down to 27 cards. Which two cards to remove? We leave that up to you. Join the discussion about New Age in our official forums. New Age Sealed will be first appearing in our free-to-enter event slot only, with 12 events scheduled each day. We will be expanding the format to our ticket event slots in an upcoming release. 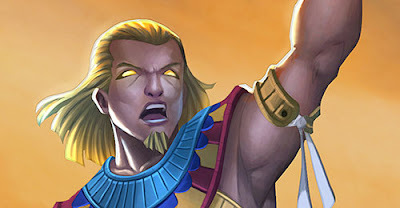 With Gods Reborn now making an impact on the meta game and everyone having had time to check out all of the new cards, its CONTEST TIME!!! We just want to know your 3 favorite cards from a player perspective, and your 3 favorite card arts! What are the prizes? One lucky entry will receive a copy of the Legendary card "Kral, Harbinger of a New Age". Three more will receive an Epic God's Reborn card of their choice! Enter your lists on the official forum thread for your chance to win! 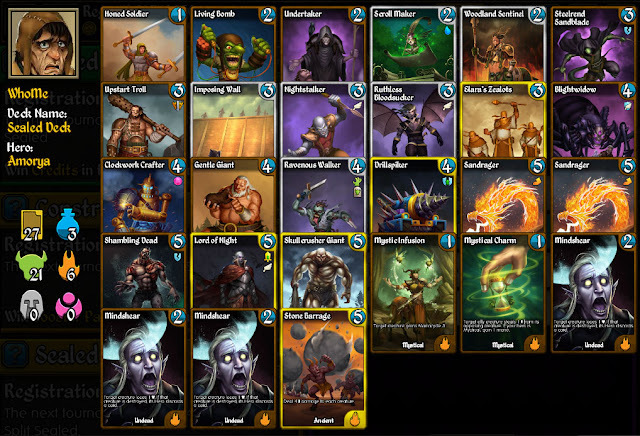 Today's update fixes a number of bugs that were brought up in the forums, and deals with some cards that were considered "overly weak" from the Gods Reborn set. Ensouled Bear is now working as written. Removing Resist from a creature that opposes Spiritbane Elf no longer results in the creature having 99 Resist. Note that this was a global fix to prevent situations like this occurring in the future. Souleater is now a shapeshifter in addition to being a Horror. This is just for flavour reasons and so that it lines up with other "changing" creatures. Lightning Elemental is now an Elf. It was supposed to be a Cat, but the art is clearly an Elf, so it was changed. After the release of Gods Reborn, we heard you loud and clear that you weren't happy with some of the Epic rarity cards in the set. Epic cards are supposed to be exciting. They might not always be at the top of the constructed charts, but they should all be cards that you think "I could build around that" or "That would be fun to play." Two cards in particular were singled out - Aether Walk and Mek Unit. We have decided to buff these cards. Aether Walk now "blinks" any creature in the game for 2 mana. As the person who set its original cost and limitation, I was perhaps a little too concerned about the interactions with Realm Crusher, Archmage and T'rror. So here you go - a constructed level card that can blink some of the most powerful effects in the game. Mek Unit was called a "bad Gob Hog" and I think that this was a fair assessment. We've taken that idea to heart and made Mek Unit a "slowly resurrecting" creature that ignores the discard pile and is a ton of fun to play. 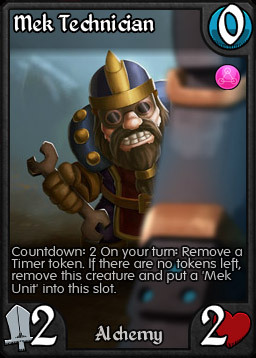 First off, Mek Unit is now just 4 mana. This is strong for a 3/3 with 2 abilities, but not out of line as it is an Epic and neither ability provides evasion. The larger change is that he now drops this guy - the Mek Technician. The Mek Tech will work for two turns rebuilding the Mek Unit. If not stopped, the Unit will replace him and be ready for battle (note: this replacement does not trigger Recycle as the Tech didn't die). Finally, we've given Queen of Dragons Indestructible. The whole idea of this card was that until you killed her, the Dragons couldn't be destroyed. The problem is that the way the game works, cards are not destroyed all at the same time - they are destroyed in sequence. 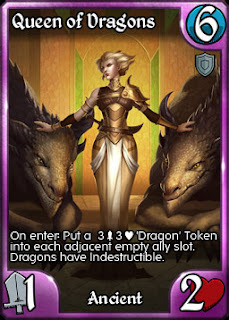 So a Realm Crusher would fail to destroy the top dragon, destroy the Queen which would immediately remove Indestructible from the bottom Dragon, then destroy the bottom Dragon. Now the card works as intended when dealing with mass destruction. Just remember to Smack, Whack or Bolt the queen first before blowing up her Dragons. A week ago the Two Kingdom era of deck building began. While there were concerns about 2K when it was announced, we've seen the new format embraced by the community at large with refined versions of old classics and the rise of all new deck types that have embraced the new restrictions. Recently we've had a number of Standard tournaments fire with 8 players vying for top spot. 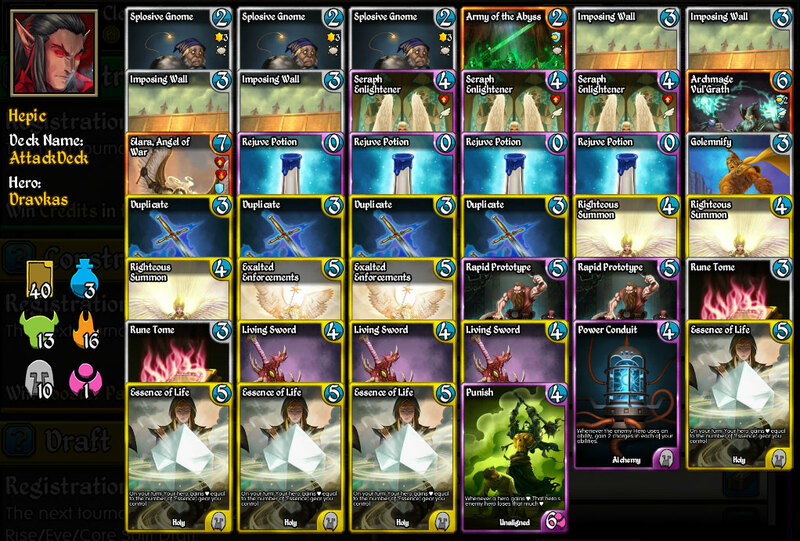 We have been watching the results and want to spotlight some of the interesting decks that players are bringing to the battle (click on the deck images to see them full size). Archa1983 recently won an event with this fully Undead Ichor deck that brings together the best that the Kingdom has to offer with a smattering of powerful Unaligned cards. This deck focuses on putting out threat after problematic threat, using Ichor's Wrath of the Dead as its main removal, and Raise Minion and Dreadful Return to bring back threats that you thought you'd dealt with. The threat density is so high in this deck that if the opponent falters for even a turn, they'll be overrun. Note that the deck is almost immune to Prophet of the Void and Silence as well, making it particularly challenging to sideboard against. With decks having to adjust their removal suite so that stays on Kingdom, this little wall has been holding off a surprising number of attacks in the last week. It's too big for Smack, too small for Final Verdict and immune to Pacify effects (it wasn't attacking anyway). 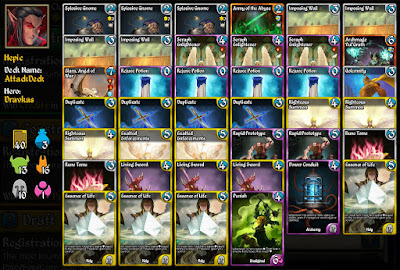 One such deck that embraced the shiny wall is this deck by Hepic. Hepic combines Alchemy with Holy for a surprisingly resilient Dravkas combo deck. 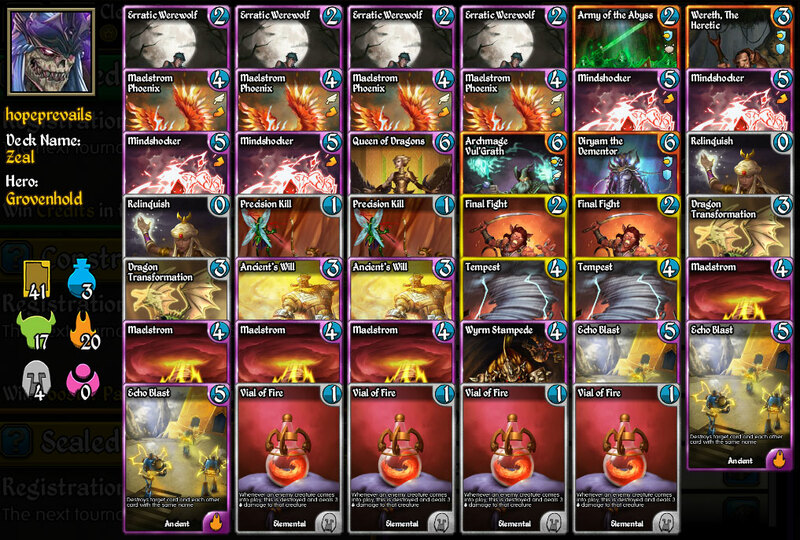 This streamlined deck works to get far ahead in Life totals, with Seraph Enlightener (and 3 Righteous Summons to find her quickly) acting as both another source of life as well as being the key win condition. A full suite of Imposing Walls are here to hold off the opponent while Hepic gets his combo together, which doesn't take long here. Drakvas can Tinker an Imposing Wall into the Seraph, or a Living Sword into Essence of Life (with free creature to go with it!). It's a strong strategy to deal with an aggressive, creature based meta. We're also seeing some radical changes happening in the Standard Arena as well. While the top echelon of heroes hasn't changed, (Arcanos, Thania, MEK, Jorma, Bothar - in that order), we've seen the winning percentages drop for these decks, suggesting that new decks are eating into their success. Two of the heroes that have seen the largest rise in use and success are Felincia and Wiloryn. In the 10 days prior to Gods Reborn and 2K, Felincia only represented 1% of all battles in the top 100 and saw only a 27% win rate. Wiloryn was similar, appearing in 3% of all battles, while riding a 31% win rate. Now both are sporting a 54% win rate, and have shot up the charts to be both just outside in the top tier when it comes to use (Wiloryn now at 11% and Felincia at 6%). 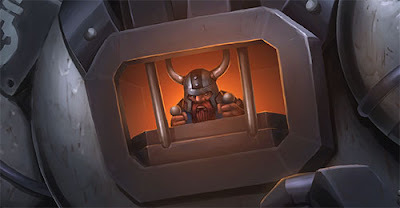 Its clear now that 2K has a lot of room for creativity and that with decks unable to just cherry pick the best cards from all Kingdoms, some little-played cards are finding key roles for top deck builders.